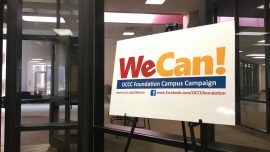 Oklahoma City Community College will have its first food pantry in order to address student hunger, its president said recently. He said he had a meeting last spring with 30 faculty members to discuss student success. Steward said what dominated the conversation was ultimately hunger. “The faculty told me, “you want to do something about student success at OCCC, do something about student hunger,” he said. Steward said many students who attend OCCC had free or reduced meals in high school, so the transfer to a college without those benefits affects the students’ ability to learn throughout the day. Working with Von Allen, head of the OCCC Foundation, Steward said a plan was developed almost a year ago to find a solution to the school’s hunger problem. A few months ago school officials decided to create a food pantry. Dr. Shanna Padgham, a political science professor and a member of the President’s Advisory Council, applauded the decision to create a food pantry. Padgham said she and journalism professor M. Scott Carter also discussed ways to support a food pantry. M’Lou Smith, a sociology professor at OCCC, has been doing research on student hunger and homelessness and many other problems that plague students. Signs put up around campus for people to find out more information about the OCCC Foundation. Smith shared her findings with Steward. OCCC officials examined the food pantry at the University of Central Oklahoma for ideas. She said donations as small as $1 could equal five meals for a student. Padgham said school officials are currently looking for a location for the food pantry. “They want to put it in a place that is appropriately discreet for students to be able to go collect food items they need without feeling like it’s an invasion of their privacy or they would be ashamed to go there,” she said. Padgham said OCCC officials want a food pantry to be a positive resource for students so they can be more successful in college. “The saddest thing to me is to say I have a student who has so much aptitude and intellect and the thing that might be holding them back is that they’re hungry,” she said. NOTE: This story was updated with corrections and new information.